※ SpCas9 (from S.pyogenes) 를 이용한 AAV meditated CRISPR/Cas9 Genome Editing은 AAVpro® CRISPR/Cas9 Helper Free System (AAV2) (Code 632608) (Two vector system)을 확인하세요. AAVpro® CRISPR/SaCas9 Helper Free System은 single guide RNA (sgRNA)와 SaCas9 (from Staphylococcus aureus) 유전자를 발현하는 Adeno-associated virus 2 (AAV2) particles를 Helper virus 없이 제작 가능한 제품이다. 본 제품은 S.aureus 유래의 SaCas9과 sgRNA를 하나의 벡터에서 발현할 수 있는 single vector system이다 (그림 1). S.aureus 유래의 SaCas9 nuclease의 유전자 크기는 3.3 kb로써, 기존에 사용되어왔던 Streptococcus pyogenes 유래의 SpCas9 nuclease (4.1 kb) (보통 Cas9이라고 명명함) 보다 약 1 kb 정도 작다. 그렇기 때문에 하나의 AAV vector에 sgRNA 발현 유전자와 SpCas9 발현 유전자를 한꺼번에 삽입이 가능하게 되었으며, 이는 in vitro 및 in vivo에서 다양한 세포에서 효율적으로 Genome editing이 가능하다. 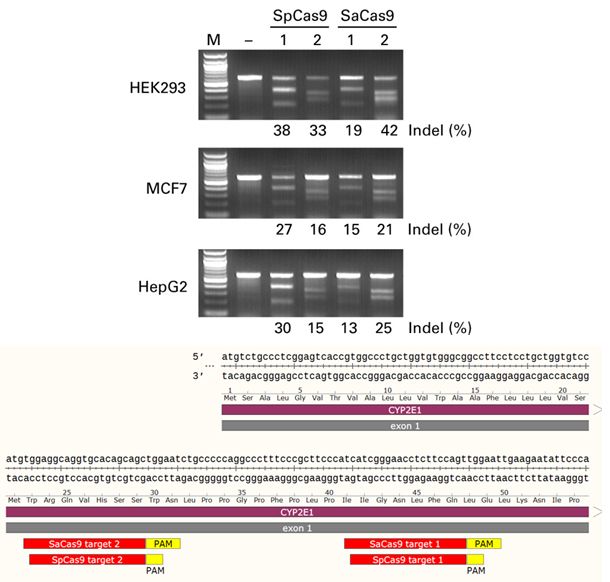 반면, SaCas9의 경우 SpCas9과 PAM 서열 (Proto-Spacer Adjacent Motif) 및 target sequence의 길이 (20 - 22 nt)가 다르므로 sgRNA 디자인 단계를 고려할 필요가 있다 (그림 2). 본 제품에 포함되어 있는 SaCas9/sgRNA 발현 AAV vector, AAV packaging에 필요한 pRC2-mi342 vector 및 pHelper vector를 HEK293T 세포주에 도입을 하면, Helper virus 없이 고순도 및 높은 Titer의 AAV particle을 얻을 수 있다. 본 제품에는 AAV production 및 CRISPR Genome editing을 위한 모든 제품 (Ligation mix, Stellar™ Competent cells, AAV Extraction buffer 등)이 포함 되어있다. pAAV-Guide-it-1 vector를 패키징하고 있는 AAV particle을 Target cell line에 transduction함으로써, SaCas9 단백질과 sgRNA 유전자가 동시에 함께 발현된다. 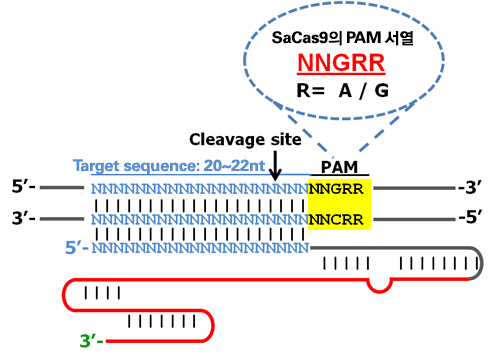 SaCas9의 PAM 서열은 NNGRR (N=A, T, G, C / R=A/T)이며, PAM으로부터 3 - 4 bp의 염기를 절단한다. 또한, sgRNA의 Target sequence는 20 - 22nt를 권장한다. SaCas9의 sgRNA 디자인은 http://benchling.com에서 가능하다. CYP2 Exon1 유전자 중, 2개의 다른 배열을 editing 표적으로 하여 Two vector system인 AAVpro® CRISPR/Cas9 Helper Free System (AAV2) (Code 632608) 과 Sinlge vector system인 AAVpro® CRISPR/SaCas9 Helper Free System (AAV2) (Code 632619)를 사용하여 AAV mediated CRISRP/Cas9 editing을 수행하였다. 12-well plate에 1 x 105개의 세포를 seeding, over night 배양 후, SpCas9 or SaCas9 virus vector를 1 x 105 MOI로 감염시켰다. 72시간 후, 세포를 회수하고 Genome DNA 변이도입 효율을 Guide-it™ Mutation Detection Kit (Code 631443)을 사용하여 분석 및 비교하였다.